Published on January 23, 2013 in Instruments and Retail. 0 Comments Tags: 2013 models, Bass VI, Fender, Pawn Shop, Squier. Fender sent out an e-mail blast this week which, among other things, listed some new guitars in their Pawn Shop Line. Most interesting to me was the re-appearance of a Bass VI! I wrote a fairly comprehensive article about the Bass VI back in 2006 (CLICK HERE). At the time I was really interested in the Bass VI as a way to bridge my bass playing skills to 6-string. The Bass VI was a premium guitar from Fender which didn’t fit in my budget, but I tried out a couple of the Baritone Jaguars that Fender put out as a response to demand for a guitar in this class. You can read the article I linked to above where I compare the guitars, but ultimately I didn’t keep either of the guitars I tried and decided to invest in some regular 6-string electrics. That said, this appearance of the Bass VI in the Pawn Shop line has me pretty interested in the Bass VI again. The guitar is introduced at an MSRP of $1079.99 (street price is estimated at $799) which makes this the most affordable Bass VI in a long time. Keeping with Fender’s tagline of “Guitars That Never Were But Should Have Been” the Bass VI gets a slight makeover and improves the guitar. For one thing, Fender removed the complicated and awkward bank of pickup switches and replaced it with a more conventional 5-position switch. Additionally, they replaced the bridge single-coil pickup with a humbucker that at first glance looked like a P90 or P100 but is in fact the Jazzmaster Humbucker (designated JZHB). This will give the guitar some interesting tone options not available in any of the previous Bass VI or Jaguar Baritone configurations. They did keep the distinctive locking tremolo and floating bridge that the Bass VI had and maintained the 30″ (76.2 cm) scale. The Pawn Shop Bass VI comes in three colors: Black with tortoise pickguard, Three-tone Sunburst with tortoise pickguard, and Candy Apple Red with painted headstock and parchment pickguard. The Bass VI comes out on March 19th, according to Guitar Center, where you can pre-order it. In the vast history of electric guitars from Fender, the Bass VI is somewhat obscure and harbors a kind of cultish, rabid fanbase. It remains to be seen if this re-introduction will widen the visibility of the Bass VI, but I think that there is pent-up demand from people who have been unwilling or unable to pay premium prices for a used Bass VI. 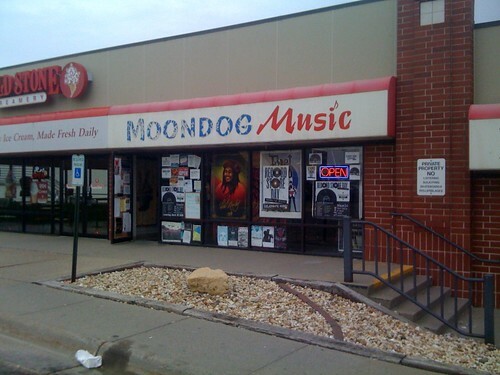 If Guitar Center here in Cedar Rapids gets one in, I’ll go try it out and report back. 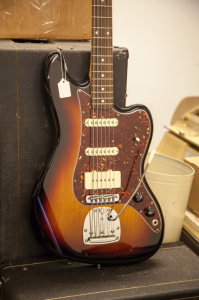 Click Here to read my article comparing the Bass VI to the Baritone Jaguars. Click Here to Go to Fender’s Pawn Shop Bass VI page. UPDATE: You can now get a regular configuration Bass VI as a Squier! 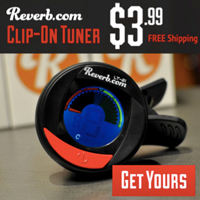 Click the pictures below to check them out at Reverb.com – The Marketplace for Musicians! Published on September 1, 2010 in Bands/Artists, Instruments and Music. 0 Comments Tags: Blu-Ray, Brian Eno. Bob Dylan, CD, daniel lanois, dvd, Emmylou Harris, Le Noise, LP, Neil Young, Neil Young Archives, Old Black, Peter Gabriel, upcoming release, Vinyl, Willie Nelson. Neil Young’s new solo album Le Noise will be released on September 28th. A collaboration with studio-genius and five-time Grammy Award winner Daniel Lanois— the album promises to be sonically one of Neil’s most distinctive releases in a catalog that spans over 50 years and 40 albums if you only include titles credited only to him! Although Lanois has a notable career as a musician, he is probably best known for his work producing or co-producing such bands and artists as U2 (Unforgettable Fire, The Joshua Tree, All That You Can’t Leave Behind), Bob Dylan (Time Out of Mind), Peter Gabriel (So, Us), Brian Eno (Apollo, Thursday Afternoon), Emmylou Harris (Wrecking Ball), Willie Nelson (Teatro), Robbie Robertson (Robbie Robertson) just to name the big ones. Even though you can see from just this list how Lanois and Young worked in the same music circles (Dylan, Emmylou Harris, Willie Nelson and Robbie Robertson), this is the first time they’ve collaborated on a record. Considering that Lanois’ on solo recording as well as records by guitar-loop wizard Michael Brook are typically built up around a single instrument, I have an idea how this record might sound. Neil Young is generally not regarded as an artist who varies much in his sound– he’s either running full-tilt distortion with his 50’s vintage Gibson Les Paul known as “Old Black” or in a stripped down acoustic folkie mode. Certainly he has painted very complex paintings with just these brushes in his passel over the years– but he’s never to my knowledge worked with a producer that leaves such a distinctive signature as Lanois does. It is comforting to know that an artist with such a legacy and history who is being forced to look back on his career in the form of the work surrounding The Neil Young Archives is also looking forward– and really would we expect anything less? Published on July 9, 2008 in Instruments. 0 Comments Tags: Artist Series, Billy Corgan, DiMarzio, Fender, NAMM, Signature, Stratocaster. I’ll admit to once being a fan of The Smashing Pumpkins. Although, I stopped listening to them after Mellon Collie and the Infinite Sadness but up to that landmark third album I really believed that Billy and his attendant whine could do no wrong. I don’t know what happened after that. Maybe Billy shaved his head, I don’t know. Although there are folks who swear by Adore and Machina maybe I’m just missing it. I still think Billy is one of the guys who took his shoegazer influences and built on them to make a signature sound. So, when I saw that Fender announced at Summer NAMM the new Billy Corgan Artist Series “Signature” Stratocasters I took some interest. Effectively, we have two new American Hard Tail Strats (the first since they were killed off in 2006). One interesting aspect to them is that they utilize a CBS-era “big” headstock on a satin polyurethane-covered 22-fret maple neck. Not something I’m used to seeing on an American Stratocaster. The body is a standard “contour” alder body with satin nitrocellulose finish done with tasteful “tuxedo” (white knobs on black pickguard, black knobs on white) trim in two colors: classic Olympic White, or black. Then we get to the parts that Billy influenced. In the interview with Billy on Fender’s site, he says that he didn’t set out to make a guitar that would give the player his sound, but a guitar with a “modern” “high gain” guitar that a player could express themselves on. That said, it is a guitar that he is currently playing in the spirit of Artist Series guitars like Clapton’s “Blackie” (not the mega-thousand-dollar reproduction of his 70’s guitar but the one that he designed for Fender). To achieve this high gain, Billy worked with DiMarzio to develop a “Billy Corgan” single-spaced humbucker pickup that this guitar is using in the neck and bridge positions. This guitar is also utilizing a DiMarzio “Chopper” in the middle. However, rather than just making a “hot rod” Strat with humbuckers, he has the 5-position switch providing any of the three humbuckers or the neck and bridge with a split of the middle. Oddly, the middle position only gives the Chopper in a humbucker mode rather than all three humbuckers being hot. Billy explains that he wanted to preserve some of the single coil sound that it’s known for rather than just loading the guitar up with humbuckers. I’d argue that the classic Strat sound doesn’t involve any DiMarzio pickups OR humbuckers for that matter. Still the guitar seems intriguing to me. 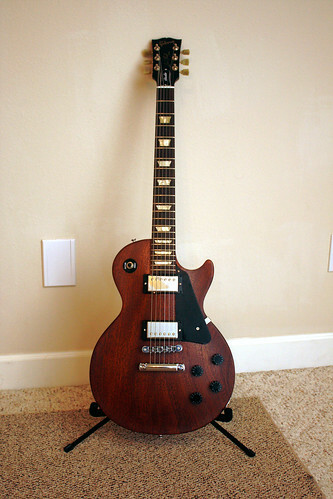 I’m kind of in the market for a Les Paul to achieve a humbucker sound in my collection, but maybe this is the guitar to do it, and it would look great next to my black Hard Tail Strat and my black P-Bass. Unfortunately, it will be a bit before anyone takes delivery of these since they were just announced (unless Fender would like to send me one for review– I’ll take an Olympic White one, thanks!). This guitar MSRP’s at $1999 and comes with a vintage tweed case that fits the big headstock. If I manage to try one of these out, I’ll write a review here. 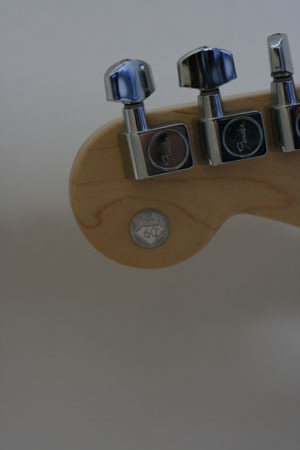 I came home today to the new Fender Frontline in Home– the second issue! The cover and inside cover are promoting the new Eric Clapton Crossroads Guitar Festival Strat and Twin with the line art logos for Crossroads Antigua which is a charity that supports a treatment center for chemically dependent people and their families. There will be 100 guitars with 50 matched to amps. These guitars are going to be handcrafted at the Custom Shop to Clapton’s specifications and each with the smiling sun logo that he designed. The guitar is $20000 and the guitar/amp combination will be $30000. Other new and interesting items in this catalog include the Joe Strummer Tribute page. I got to see one of these up close in King of Prussia, PA at Sam Ash. While I really like the idea of this tribute guitar, I have a hard time justifying over $800 for a Mexican telecaster. Plus, it doesn’t look as good up close. It is one thing to be relic’d, but the matte black finish makes it look kind of fake. Just my opinion, of course! This issue also includes the new California Series Sonoran SCE Custom Acoustics. These are kind of cool looking– coming in some vintage “surfy” colors with painted headstocks. I’d consider one of these. 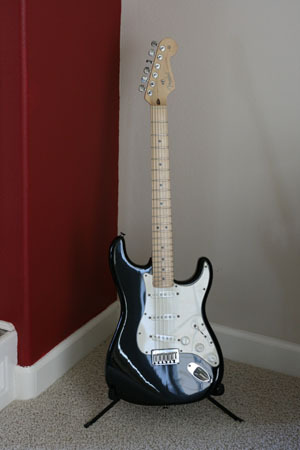 It certainly would look nice hanging next to my other Fenders since it has a CBS Strat-looking headstock on it. Another free T-shirt!! Again, you need to do a “test drive” at an authorized Fender dealer. This time you don’t need to test drive something in the catalog– which is an improvement. Test drive any Fender product. 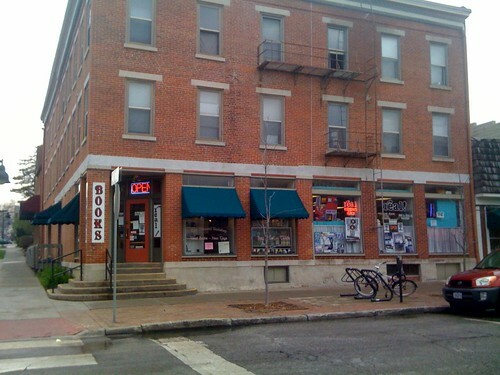 Last time I went to Guitar Center and the only thing they had was the “VG” Stratocaster from the catalog. This T-Shirt looks much nicer than the last Test Drive– this one has a ’52-ish Telecaster leaning against a classic Twin amp with a simple Fender logo under it. Still on a black Tee. I know what I’ll be doing this weekend! A focus on the Squier Artist Series with the Avril Lavigne Telecaster with the nifty Cheap Trickish black and white checkered pickguard. Basses from Pete Wentz, Mike Dirnt and Frank Bello. I guess it is cool to bring the Artist Series into the budget line. Also a Rockband ad showing the new Stratocaster controller for Rockband. That’s cool. Much cooler than the Rockstar SG’s. I see a new Mexican Telecaster called the Blackout Tele. A Standard Mexican Telecaster with maple neck, dressed in black with a three-layer black pickguard and 6-saddle bridge. Has a third chrome “lipstick” style pickup between the neck and bridge. Seems pretty unique and really sharp. I may need to try one of these to see what interesting sounds come with the extra pickup. The Power Teles have the extra single-coil, so maybe they sound like that. If you haven’t signed up for Frontliine in Home– you should if you’re into Fender products. Click Here to find the signup page. Published on July 21, 2007 in Instruments. 0 Comments Tags: boss, Fender, guitars, Ibanez, Mexican, octaver, Standard, Telecaster, tubescreamer, Used Gear. I wasn’t expecting to pick up another guitar so soon after the purchase of my American Hardtail Strat in May– nor was my wife, really! Thankfully, Sherry has been very cool about my recent guitar purchases and tries to understand the necessity for more than one 6-string electric! 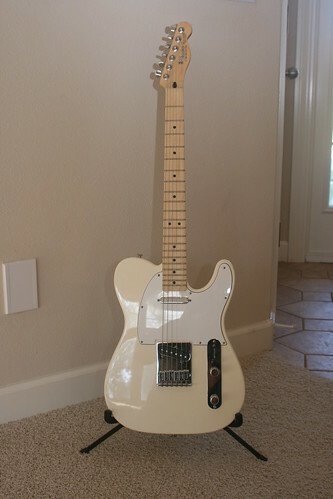 I subscribe to an e-mail search of the Cedar Rapids Music-Go-Round on Fender Guitars and saw this 2005 Made-in-Mexico Telecaster aka “Standard Telecaster.” I thought it looked very clean and was a unique combination of Arctic White with a white pickguard and maple neck. Initially I debated about whether I liked the color combination. I went in and played it a couple of times and eventually decided that it was as nice a Tele as I am likely to see used. MGR doesn’t get a lot of Telecasters in and eBay prices seem to be a bit inflated in my opinion. So, I traded a couple of effects pedals I wasn’t using– an Ibanez TS808 Original Tube Screamer Overdrive Pro Guitar Effect Pedal and a Boss OC-3 Super Octave Pedal I bought back in the early-Nineties for use with my bass that I never really used. I’m really happy with it. Overall, I’d be pretty hard-pressed to find anything about it that seemed lower quality than an American version of it. The fit and finish are very good and it is a decent playing guitar. Nice clean slappy twang to it that sounds great through the homebrew tube amp I’m using. Sherry says that she prefers the tone of this guitar over my other ones. I paid $299 before my pedal trades and it came with a non-Fender gig bag. A very good deal considering that it looks and plays new. Check out the Fender Standard Telecasters at Reverb.com! Fender Frontline Finally “In Home”! At long last I received my Frontline In Home yesterday. I’d assume most of you who signed up have also received yours. It is received with mixed feelings, however. I’m a bit disappointed with how small it is– it’s about 5 1/2 x 8 1/2″ and around 35 pages. The old Frontline was magazine sized and much thicker. I liked to have the big catalog as a reference of the current line. This version of Frontline is really more of a way for Fender to send out updates on new gear and interesting stuff with the idea that the reader would visit fender.com or their dealer to get details on the gear included or to get information about other products not included. Included in this issue is a tear-out card that will give the holder a free T-Shirt after they get it signed by their local Fender dealer after they test drive gear. Not a bad deal. I can always use more Fender-wear. I’ll likely go get that signed this weekend. Other interesting content includes a bit on the Andy Summer Tribute Tele (apparently this went to press too early to include the Joe Strummer Tribute), The new “Pro” series Strats and Teles which have the “most requested modifications offered by the Custom Shop,” the Limited Edition ’57 Stratocaster which celebrates the 50th Anniversary of the ’57, the Vintage Hot Rod Series which brings back a Telecaster with a humbucker in the neck postition in the Fender line, a couple of entries in the Squier line including an SSH Tele (when is a Tele not a Tele?) and another with a humbucker in the neck position . We are also introduced to the unexpected (at least by me) Squier Drum line. I hope that we see more mailings from Fender and other giveaways would be cool, too. One of the things that I love about Calexico is the fact that they produce these limited-run tour-only (*well, you can get them from their website, too) releases. It’s not enough that they release great studio releases– they cater to the fans with compilations of studio experiments, live songs and outtakes. 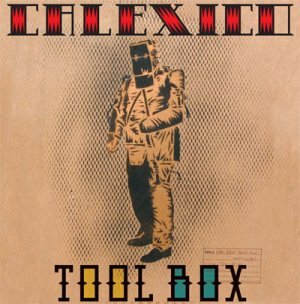 Tool Box is the sixth of these releases since 1999 and the second of instrumental songs. I haven’t ordered my copy, yet, but I’m looking forward to hearing it. According to this article in Chartattack, the album was recorded during some downtime recently during a break from the lengthy tour for Garden Ruin. The 14-track album is comprised of songs written and performed by only Convertino and Burns rather than the extended band used for the recent formal releases. Visit this page to listen to a sample from Tool Box. The Time to play b-sides archives for the Instruments category.